Plus, our drummer was the only one using in-ear monitoring at the time, and it seemed too risky. It’d be way too easy to get misaligned with the backing tracks, which would wreck havoc on the worship experience. Time passed, I became more open to the idea, and decided to give them a shot for a Christmas service. We did Kim Walker’s version of Silent Night and having all the strings, bells and other tidbits really made it feel like Christmas in the room. And the band sounded HUGE. First time with backing tracks… success. During the same Christmas Service, we introduced What a Beautiful Name by Hillsong Worship. We used backing tracks for it as well, and continued using them in the weeks following. One-by-one we added backing tracks to other songs. We loved the extra dimension backing tracks added to the sound. Plus, we had a little voice in our ears to tell us what part of the song was coming up, ensuring no one got lost. But one rehearsal changed everything. We use Loop Community’s PRIME iPad app to run backing tracks. It is probably the simplest way to use backing tracks, and we love it. Except one Sunday, I forgot my iPad. It’s been a journey, but I have learned to be a go-with-the-flow type of person. So, in my mind, this wasn’t a big deal. We’d just play without them, like we used to. It hit me like a rock. Backing tracks had become a crutch. We had developed an attitude of, “Just let the backing tracks handle it”, and used it as an excuse to be lazy with our playing. The Question: To use backing tracks, or not? No longer will I bring in backing tracks at the start of learning a new song. We will first get it sounding good without them, and possibly bring them in afterwards. So, should you use them? I don’t think there is a right or wrong answer. I’d just make sure they don’t become a crutch or “something you can’t live without”. In my experience, I have found the opposite to be true. When technical difficulties have arose and we have not been able utilize our tracks, I find that my team sounds better and is tighter than if we didn’t use them. I have not found them to be a crutch for our team. Instead, they know the arrangement and ebbs and flows of the songs (builds, down choruses, etc.) much better then before we used them. Incorporating the tracks from the beginning helps my team learn songs faster. The only time I could see it being an issue is if we had to do the 1-2 songs that we play that we couldn’t do without track support – like “Alive”. We just don’t have the players or synth capabilities to pull that song off without the tracks. If I forgot my iPad and that song was scheduled, we’d swap it out for something else. Every team and situation is different! Thanks for the different perspective, JP. You’re right – every team and situation is different. I recently took a position a worship leader and I am interested to try these maybe in the furture.. I don’t always have a full band so sometime I lead by me self on an acoustic would I be able to run this myself and what have you found to be true about t he spontaneous moments or more flowy worship style? Hey April – With Loop Community’s PRIME app, you could definitely run them yourself. Backing tracks don’t really mess up spontaneous moments because they usually happen at the end of a song. So, you just let the backing tracks fade off and you keep playing for the spontaneous moment. Then, when you are ready for the next song, you just hit the play button in the PRIME app. Hope that helps! Nope! I don’t like none of those band or tracks. I’ve done those no good, Instead I use keyboard arranger such as Roland E-A7 and Yamaha and choir that’s all I need. No more loud drum, guitar, or showing off on the stage like a entertainer. All I need is two arranger keyboard that give the whole congregation a huge orchestra sound from wind trumpet, acoustic guitar to electric guitar and so on. All musicians are on my fingertips. That kind of set up is a must due to a lot of persona and act of the band member and praise and worship team on the stage like an entertainer. this way the congregation start praising and worshiping the Lord not watching the praise and worship team performing on the stage. Very few notice and understand the true meaning of praise and worship. That’s were the miracle happen first all the way from the Pastors messages. Where do you get backing tracks and what could I expect to pay for them? 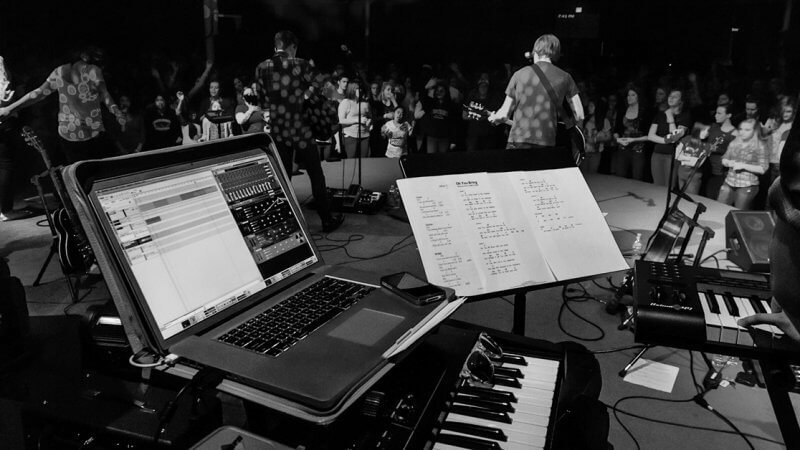 I am a 30something worship leader, and I absolutely LOVE modern worship! However, I have a more hate-relationship with tracks than anything – when they are misused. My personal opinion is that tracks should only be used for sounds that cannot be recreated live, OR if a certain musician is missing last minute as an emergency. I also hate using tracks to “double” a live musician. I love the arts. I love personal expression. And I love live music. When the congregation is listening to more things that are tracked than are live, I feel like it devalues art in the church. So, our take has been to use tracks only when there are certain sounds that “make” a song or part of a song that we can’t do live without sinking some serious money into gear. We never double anyone. And we pride ourselves in doing as much music live as possible. Thanks for the comment, Elgin! Love hearing your perspective on this.